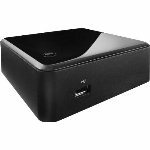 Is it worth it to even consider the Celeron NUC? Just wondering since its possible to build a cluster with 2 Celeron NUCs with 16GB RAM each for under $500. I’m already planning on using a NAS with iSCSI for shared storage. Hi, the CPU model seems to support VT-x and EPT (http://ark.intel.com/products/56056/) but it only runs at 1.1 Ghz (dual-core, no-HT) so I would say it may be a bit underpowered IMHO and I don’t know if it would work with ESXi as I have never seen a Celeron used with vSphere before (but if you do decide to go with it, let us know how you get on!). I would suggest if money is the issue, you look at the Core i3 which packs some punch but is minimal cost. Not sure if I posted elsewhere, but just wanted to say I tried it and it works! I’m using a Thecus N5550 for shared storage and it’s actually pretty fast other than the vCenter Server Appliance’s fairly long boot time. Nice one, thanks for updating! @vPeteWalker is also using the Celeron with good experience. Out of interest, does the Thecus support any VAAI primitives? It doesn’t support VAAI primitives as far as I can tell, but I think that’s to be expected considering it’s a sub-$500 5-bay NAS. One thing I do want to note though, is that beta firmware should be installed on the Thecus N5550 to enable iSCSI write-caching, which does improve performance a lot (especially if extra RAM is added to the NAS). v2.04.01.2 at a minimum should be installed. I’m currently running 2 Celeron NUCs with 16GB RAM each, and have at least 15 VMs running that are a mix of Windows 2008 Server, CentOS 6, and Ubuntu. To simulate having multiple networks available, I do have a bunch of VLANs presented to both NUCs and am running at least 6 different networks. I think my next step will be to get one Core i3 or i5 NUC so that vCenter is a bit happier and some processor-intensive VMs can migrate on and off of it as needed, but I think the Celerons are more than adequate for a lab environment.